GE Fanuc Intelligent Platforms , a unit of GE Enterprise Solutions, today reaffirmed its commitment to Freescale processors based on Power Architecture technology by announcing plans to feature Freescale’s advanced multicore QorIQ processors in forthcoming products. QorIQ processors feature up to eight cores for maximum performance, and allow GE Fanuc to develop new platforms that will be form-, fit- and function compatible with their predecessors and enable existing customers to take advantage of exciting new levels of performance at minimal cost. These new platforms will also allow lower power consumption and heat dissipation per unit of performance. Specifically, QorIQ technology will be featured in GE Fanuc’s VME-based, 3U VPX-based, 6U VPX-based and 3U CompactPCI-based families of single board computers. Support for both the eight core P4080 QorIQ processor and the dual core P2020 processor is also planned. All products based on QorIQ technology will be available in five ruggedization levels – including full conduction cooling over the -40°C to +85°C range - to meet the demanding requirements of military customers. Future GE Fanuc VPX products based on QorIQ technology will respond to the processing needs not only of the growing number of demanding, sophisticated applications, but also to the needs of customers whose existing applications are seeing bottlenecks in processing performance and I/O. 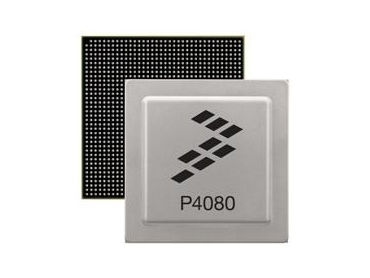 Freescale’s advanced QorIQ processors build on the heritage of, and are compatible with, the company’s PowerQUICC processor technology and are manufactured using a 45nm fabrication process, allowing them to achieve greater performance per watt. The P4080 processor is rated at less than 30 watts and combines eight Power Architecture e500mc cores operating at frequencies up to 1.5 GHz. The P2020 core operates at up to 1.2GHz and Freescale believes this is ideal for applications that have tight thermal constraints.